Thanks to Movie Man Jackson for this recommendation. Brief Synopsis – A rookie cop is sent undercover in the drug world and must try to find the fine line between keeping the law and keeping his cover. My Take on it – This is a film that I saw years ago and didn’t recall much about after two decades. The premise is actually great, but there have been other films and books that have executed such an idea so much better. They do a great job of bringing forth the dilemmas that such a predicament would create, but they have a pretty average execution of it all. Laurence Fishburne truly stands out here in the lead role. This was one of his earliest lead roles and he really manages to make it work. The problem though is with the supporting cast and characters who just don’t come across as being powerful or forceful enough as one would expect from the higher echelons of the drug dealing business. Jeff Goldblum’s character seems more like a joke than a serious drug lawyer which is quite a shame because he is usually great in most of his films. Bottom Line – Interesting premise that just doesn’t deliver as well as one would hope. 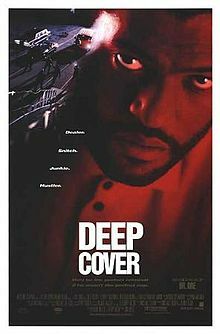 Fishburne is great here in one of his earliest roles but the rest of the cast and characters aren’t as powerful. The ideas brought forth here are quite compelling but the delivery comes across as being just average instead of as impactful as could be expected. Thanks for the reblog! This is one of the favs in the film noir genre…but I can understand where someone would have issues with it. Goldblum is great to be but there are times when the dialogue upends the dark gritty nature of it all.